Italy has raised 95bn euros (£86bn;$137bn) from a tax amnesty, much more than the government had expected. According to the country's finance ministry, 98% of the illegally-held overseas money has been repatriated. The amnesty caused a spat with Switzerland after Rome claimed the Swiss government was refusing to cooperate with the tax crackdown. 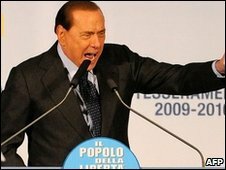 Switzerland then demanded that Italy explain why police and tax inspectors raided dozens of Swiss banks in Italy. In Tuesday's statement the ministry said "the time of tax havens has finished forever. To place or keep money in tax havens is no longer convenient, neither in economic nor in tax terms. The returns are small, the risk is high." The amnesty has now been extended until the end of April. The move provided a boost for Italy's banking industry - with the money flowing into small and medium size banks. The government will get a 5bn euro windfall from the amnesty. It will be spent helping to strengthen the economy, which came out of recession in the third quarter of this year.